Kidz Bop 28 CD Review And Giveaway! This is another album where we knew about half of the songs, but the other half weren’t familiar. The voices were (and have always been) great and I was comfortable (as a parent) with most of the songs. That said, I have one major complaint. One of the reasons that we like Kidz Bop so much in our home is because I can usually be confident that they are going to tailor the songs and language to what is most appropriate for children to hear while still enjoying the song. My kids and I are fans of Taylor Swift’s “Blank Space,” so we know all the words from the radio version. These were different, as expected, and words like “insane” were changed out for something more benign. I don’t have a problem with words like “insane” since I worked in mental health for many years and have tried to differentiate for them between “mentally ill” and when someone is just acting “insane” or “crazy” as a child would when they’re playing around. But okay, that’s not a real issue for me. The next song “Lips Are Moving” has both “dumb” and “stupid” in the radio version and these were both left in the Kidz Bop version. I know that things differ by household, but I can tell you that we don’t use the word “stupid” and I frown on the word “dumb” as well. These are personal choices, but when I see that they took out the word “insane” and left “stupid,” it makes you question whether the same person is editing these songs. So that’s my beef. Other than that issue (which may not bother you at all! ), we did really enjoy this CD. This is consistent in a long line of enjoyable albums put out by Kidz Bop. 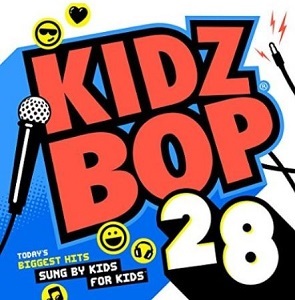 To get everyone excited about this new album, I am giving one lucky winner a copy of the Kidz Bop 28 CD! To enter this giveaway, complete any or all of the options listed below. Giveaway ends 4/18. Good luck! I like I’m Not The Only One. “Uptown Funk” is a fun song! My son LOVES Kidz Bop CD’s! I’d like to win this for him. As a mom who does not like foul words, I appreciate that most if not all “mean” words are excluded. Blank Space is my favorite.